Just like that, we find ourselves Shut Out…Rejected…Disapproved. It’s natural for us to want to “measure up.” We desire to be valued, loved, and we want so much to fit in. But the many things that preclude us from the acceptance we so desperately seek only proves that when it’s left up to us, we fall short. As our inadequacies pile up faster than smelly garbage lining the block in Brooklyn on trash day (trust me that’s a LOT of stinkin’ trash), we can come to only one conclusion: We are needy, sinful people. And we’re frantically looking for ways to fill the void so we can feel whole. But what if we could BE whole? The big things of this life are no comparison to our biggest problem on the scale of eternity. Apart from a saving work of Jesus Christ in us, we face judgment and wrath. Our greatest need of validation and acceptance is that with God Almighty. As we look around at all the other areas that have us pan-fried in failure, we can trust this: God does NOT fail. NOT EVER. And He knows us completely. He knows our perishable frame, and God knows what we need most— Him and His acceptance of us. There’s no password or secret handshake with God. Just FAITH. It comes on the basis of God Himself and the perfect atoning sacrifice He provided on our behalf. So it NEVER. FALLS. SHORT. Defeat ushers in thankfulness for the eternal victory that will never be lost. We aren’t validated by our failures or even our successes. Eyes fixed on validation rather than the One Who validates miss out on the spectacular view faith has to offer. The hope we have in Christ is strengthened in our weaknesses. Because God is the guarantor of this promise, we never have to worry about how it will turn out. And since God also initiated it, we don’t have to do anything to attain it. 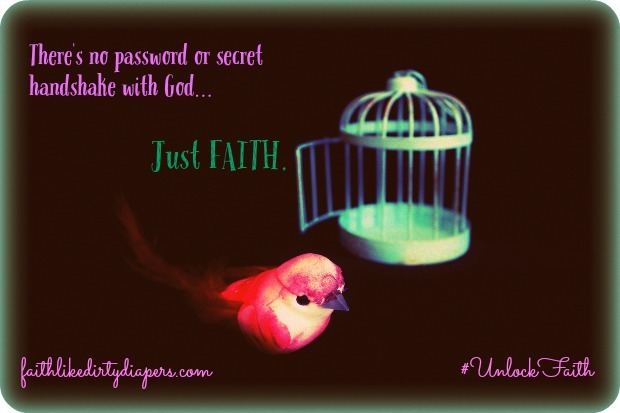 Acceptance through Jesus is offered to us freely by faith—it’s not in a “password protected” area in our world. And if that is ALL I ever have, if I never succeed at anything and everything falls apart, His word, His kingdom, and His Glory will stand forever. I love this, Christi! I’m so grateful there’s no exclusive password to have a relationship with Jesus!!! Great to see you on #livefreeThursday! Thankful for God’s love, grace, and mercy. Soaking it all in today. Great post!